Hardness testing is most commonly done using bench top or floor standing instruments. These have proven to be reliable, accurate, and robust for many years. But how do you perform hardness testing in the field for things like pipe weld inspections? How do you test parts that are too large to position on a bench top unit? How do you test areas of parts that are inaccessible to the benchtops? The UCI (Ultrasonic Contact Impedance) hardness testing method was developed in the 1960’s to address these challenges. It allowed hardness testing with a portable unit. Conversion tables were developed to allow hardness tests to be converted to industry standard scales, such as Rockwell, Brinell and Vickers. One of the most popular of the portable UCI units was the MIC 10 from Krautkramer, later acquired by GE. This unit combined ease of use, accuracy, and durability in a small package. Thousands were employed around the world in diverse applications including: heat affected zone (HAZ) analysis, shop floor heat treat verification, and copper chrome plating testing. While this product was very successful, GE decided to allocate R&D resources towards higher priced products, and the MIC 10 became somewhat dated. GE stopped manufacturing the MIC 10 in late 2017, continuing to support the instruments that it had sold, but not offering a replacement product. Berg Engineering and Sales was one of the most successful GE distributors selling the MIC 10. Berg has been at the forefront of UCI hardness testing since the 1960s. Management there searched for a product that could meet the needs of their existing MIC 10 user base, as well as those new to portable hardness testing. An exciting new product from Germany fit the bill. NewSonic GmbH in Germany, with an engineering team including former engineers from the UCI technology teams at Krautkramer and GE, saw the need to create a new instrument with the MIC 10’s features. NewSonic developed the SonoDur2, combining the size, accuracy and durability of the MIC 10 with a modern touchscreen interface and industry standard interfaces including USB, Micro-SD-Card, WLAN, and Bluetooth. The SonoDur2 by NewSonic is the latest model of digital UCI hardness testers, replacing GE’s MIC 10 and 20 as the new standard. It has the reliability of robust IP54 protection along with lightweight (~280gr) portability, plus, it includes a rechargeable, replaceable battery pack. The SonoDur2 comes equipped with data logging in line with current Windows software and free, automatic software updates. And with its bright TFT-color-display (readable even in sunlight), the SonoDur2 also provides intuitive instrument navigation via a Touch-Screen and Illuminated Keypad, as well as a storage capacity of up to 32 GB. 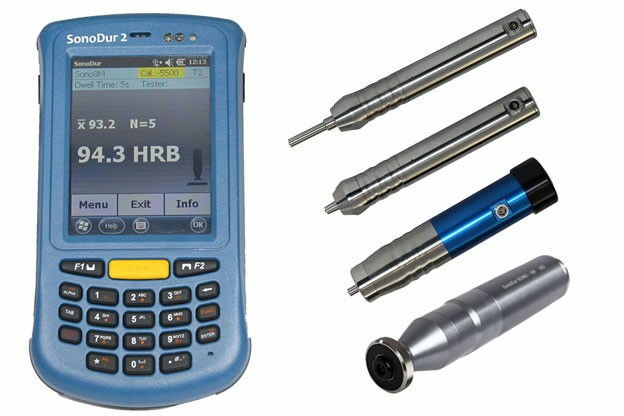 The SonoDur2 has a family of probes and accessories available, including hand-held probes with test forces of 1-3-5 and 10 kgf; and motorized probes with test forces of .1,.2, and 0.9 kgf. “Long Rod” and “Thin Tip” versions are available for applications requiring access to small areas, such as gear teeth. Also available are a variety of probe shoes that can help to steady the probe on a variety of geometries, portable test stands, and reference test blocks. The MIC 10 and MIC 20 had long, successful product lives, but it’s now time for a new tester, the SonoDur2 from NewSonic, to take the lead as the best handheld UCI tester in the world. Have questions about hardness testing and which NewSonic probes are best for your particular application? Contact us by calling 847-577-3980 or email us at info@bergeng.com. One of our knowledgeable Sales Engineers will be happy to assist you.